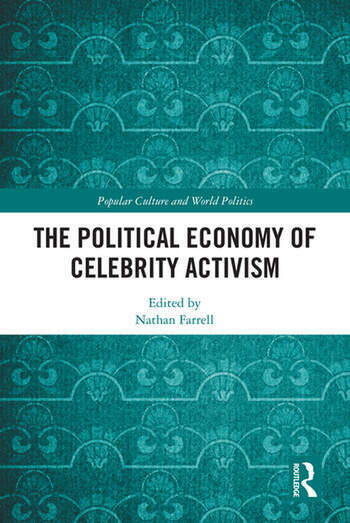 This edited collection brings together scholarly works of both a theoretical and empirical nature to critically analyse the forms and functions of the contemporary celebrity activist, and to examine how these intersect with the political economic structures in which celebrity activists operate. Collectively, the volume illuminates some of the inherent tensions between the ethos of solidarity and compassion that the celebrity activist works to generate, on the one hand; and the processes of corporate sponsorship and discourses of individualism upon which the celebrity often depends, on the other. By offering empirical case studies that situate instances of celebrity activism within specific political contexts, the collection highlights how celebrity activism intersects with some of the underlying structures of gender politics and political discourses such as neoliberalism. In addition, the volume discusses how the tensions between, for example, individualism and solidarity can raise important questions about the authenticity of individual celebrity activists, and how individual celebrity activists work, with varying degrees of success, to obfuscate such tensions and obscure the potential contradictions of their work. This book will be of great interest to students and academics within the fields of politics, international development, political communication, social movements, activism studies, and celebrity culture. Nathan Farrell is Senior Lecturer in Media and Communication at Bournemouth University, UK. His research interests include celebrity activism, corporate social responsibility, and popular culture. His work on celebrity activism has been published in a number of international journals.